Referring to suggestions that Libya’s security situation is improving, the ambassador was quoted by NOC as saying that “this encourages companies, not only Korean companies but all foreign companies, to return to work in Libya”. 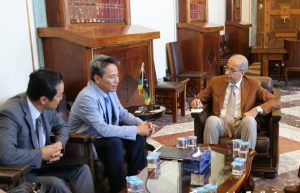 He is also quoted saying that a number of Korean companies would be visiting Libya shortly to discuss a possible return. However, a Korean official told the Libya Herald this evening that despite the talks, the Korean government still had not decided as to whether Korean companies could return. Similarly, there had been no decision on reopening the Korean embassy. The ambassador separately met Elkabir and Sanalla today. The Korean National Oil Corporation has had a stake in the Fil field alongside Italy’s Eni and Sanalla wants to encourage as many foreign oil companies as possible to invest in exploration and production so as to increate output. Sanalla, who stressed the good reputation that the Korean companies had in Libya, particularly in the oil sector, asked the ambassador to organise a series of conferences with the Korean and Libyan companies to discuss developing cooperation, to be held either in Libya or by televised link. A return of South Korean companies was also the main subject in the talks with the CBL’s Elkaber. With Libya continuing to suffer constant power cuts, GECOL is particularly keen to get South Korean companies to return and complete work on power stations. Two Korean engineering giants, Hyundai and Doosan, were building the $.5-billion 1,400-MW Khaleej power station in Sirte and between them had almost a thousand workers on the project until they pulled then out in August 2014. Hyundai was also involved in expanding Tripoli West power station. Yesterday, the ambassador was given a tour of the Tripoli West station and local officials pressed on him the importance of finishing the upgrade in the hope of securing an early return of the South Koreans.